When winter is approaching, I often get asked whether it will be cold, snowy, mild, or wet. After a very snowy, colder than average winter of 2013-2014, I told most going into the season that the winter of 2014-2015 would be less snowy, but colder than the winter of 2013-2014. While December did not go according to plan, the overall winter forecast worked out. 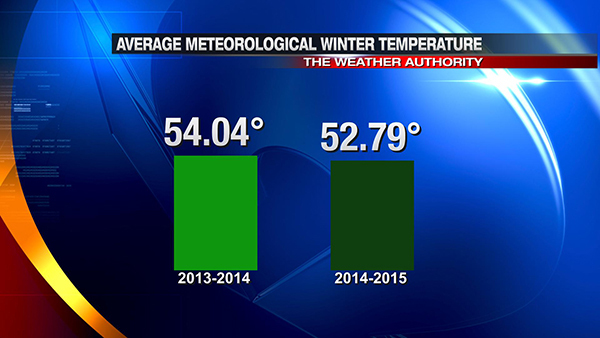 When winter weather hits, most compare it to a previous winter or another place where the weather is more extreme. The common phrases I’ve heard this year were “at least it’s not as bad as Boston” and “at least it’s not as bad as last winter.” The latter phrase always gets me thinking. 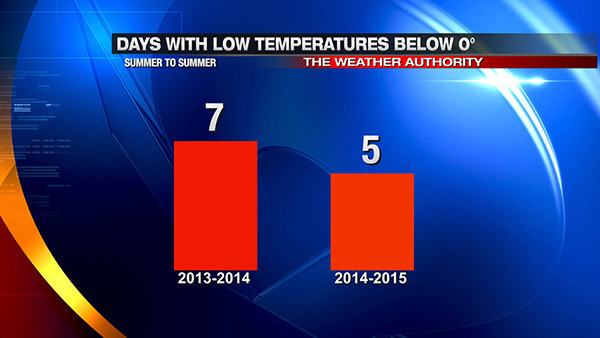 How is this cold season measured against last year? Is this measured by snow? Is this measured by cold? 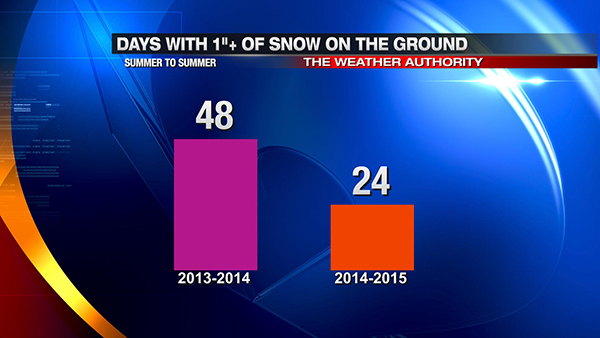 Is this measured by how many days snow has been on the ground? Everyone has a different way to measure a winter, and that’s the way it should be. So has the cold season of 2014-2015 been worse than that of 2013-2014? Let’s compare the two using several different scales. It is highly unlikely that 2014-2015’s count will be anywhere close to 2013-2014’s count. However, the 10″ of snow on the ground at 7am on February 21, 2015 was more than any single day from late 2013 through early 2014. While 1° doesn’t seem like much, that is a significant difference given that the average temperature of the season is the daily average temperature averaged over 3 months. It is rare from late March through early November to have a high temperature below 32° in Cincinnati, so the current tally of 32 days for 2014-2015 is unlikely to rise much if at all. In my opinion, winter 2013-2014 was worse than winter 2014-2015. For the former, the amount of snow was overwhelming, and the shots of cold were sharper. For the latter, the cold was more prolonged and the winter storms produced more snow. This cold season, however, is bottom-heavy, meaning most of the snow and cold came late (and we’re not done yet). Had December 2014 been colder, this cold season would have easily rivaled the cold season of 2013-2014.
i hated going to work the winter of 2013/14, I remember one morning my bosses dad had to come get me from work because it was so cold out that when I was trying to get in my girlfriends truck to go to work, hte door handle broke because i pulled so hard trying to get it open, i ried everything, pouring warm water over it, inside the door nothing would get the door to unstick!!! LMAO…. My boss almost didnt believe me i think an thought i was just trying to call off of work!! When his Dad got there an he seen the truck he believed me, plus I got to show my boss it in person because I work at a Auto Repair Shop in Royal Oak (13 &Crooks Auto Repair-Sunoco- Oil Changes just $19.99) lol an m\ I had to get the door handle special ordered, at least since i work at the shop we get really cheap prices, and i had it fixed that day and didnt have to work out in the cold trying to fix it!!! to do anything, we had a fridgeed winter last winter, there were to many days that were below Zero, or just 1 or 2 degrees out!